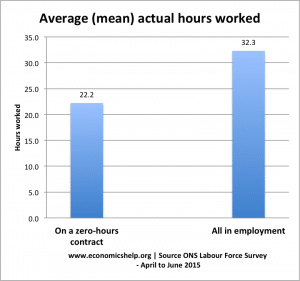 Zero hour contracts means that workers are employed without any guarantee about the amount of work they will gain. In the past decade, the numbers working on zero hour contracts has significantly increased from 100,000 in 2000 to over 700,000 in 2015. This now accounts for approx. 2.4% of the workforce. Supporters argue zero hour contracts have helped to increase labour market flexibility, reduce unemployment and reduce costs for firms. For some workers, the job flexibility is advantageous. However, the rise of zero hour contracts have increased the phenomena of under-employment – where people have a job, but less hours and income than they would like. Critics argue that zero hour contracts lead to lower income, greater job and financial insecurity and reduced quality of life. 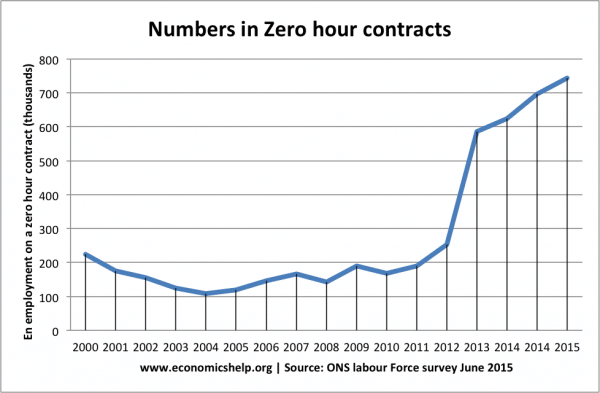 A sharp rise in zero hour contracts since 2011.
workers have no fixed amount of hours. Workers are under no obligation to take work when offered. Zero hour contracts are more likely to be found in sectors, such as accommodation and food, and health and social work. This includes jobs, such as interpretors, sales, care works and even security. According to government estimates 23% of employers now use zero hour contracts, including firms, such as the Co-op funeral staff, the House of Lords, Boots, McDonald’s, Poundland, Abercrombie & Fitch Bupa, Cineworld, Centerparcs, and the NHS. the highest percentage of zero hour contracts are amongst the age group 16-24, with 6.7% of workers (16-24) on zero hour contracts. A worker may get a verbal promise of many hours, but then finds that they earn much less than they expected. In practise, it is difficult to look for other jobs, whilst on a zero hour contract. It makes it difficult to plan work and leisure because firms may call at the last minute. It can lead to insufficient income, leaving workers struggling to pay bills. Workers may prefer the security of a fixed income from benefits rather than the volatility of zero hour contracts. Whether zero hour contracts increase employment is open to debate. Some feel they are a way to just replace traditional work contracts with more profitable flexible working practises. 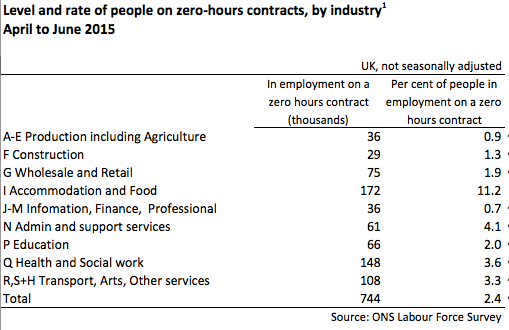 41% of workers on zero hour contracts are looking for a replacement job or more hours in existing job. Enables people to work around childcare and other commitments, some workers may like the flexibility. Helps firms become more competitive and hang on to workers, who otherwise would be made redundant. 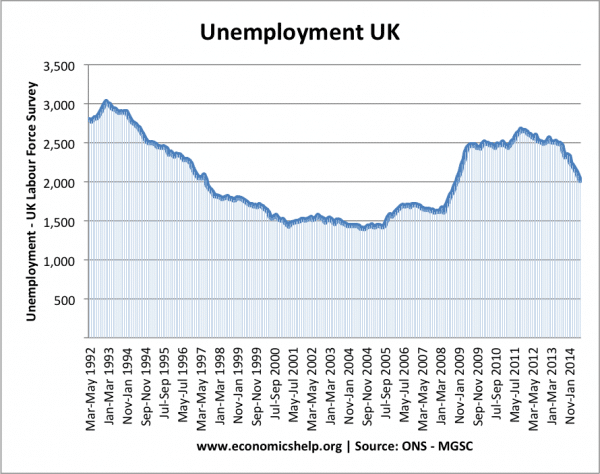 The rise in UK unemployment since the start of recession of 2008 was relatively muted, zero hour contracts could be a reason. Since the end of the recession, unemployment has fallen quicker than in previous recessions. This fall in unemployment has corresponded with a rapid rise in zero-hour contracts. This entry was posted in labour markets and tagged work. Bookmark the permalink. ← Does the government determine the interest rate for bonds? Broadly this article presents three points in the defence and support of ‘zero hours contracts’ as against seven criticising such contracts. Of the three points defending such contracts two are clearly on the side of the employer. There are many more points which I can raise in argument against these contracts, suffice to say that they are totally exploitative and have the effect of treating the worker not like a human being but as an object that can be exploited for the sole benefit of the employer. These contracts could only have come into being because employers today have the upper hand. The situation is victorian and strips the worker of all dignity. As a start I would ask anyone promoting these contracts to try living on no income at all for months and with the added uncertainty of not knowing when they would get any work. I have had to work under this sort of contract for a number of years and the best wish I have for those who ever devised these sorts of contracts and those who use them is that they all roast in hell for eternity. I have suffered under this kind of exploitation for too long ; a human being should never have to suffer like I have. It is intolerable and has brought me to the verge of ruin.